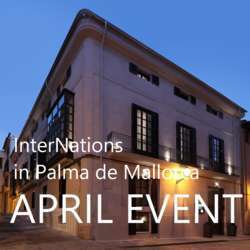 We are happy to invite you all – residents and guests of Mallorca – to our Balearic Islands April Event! This time we chose a nice 5* Boutique Hotel, which has a nice terrace and we can be inside and outside as well, in Palma's Borne district. Súmmum is known for its glamour, so it is the perfect place to meet new people and old friends. Please join us at this wonderful location from 19:30 onwards, where we can enjoy some drinks together. Parking is recommended in the public car park at Paseo Mallorca. Please don’t forget to register for this event by clicking the Attend button and feel free to spread the word amongst your friends, co-workers and other global minds, and invite them to sign up for InterNations, too! Please have your QR-Codes ready at the door! We are looking forward to seeing you all there! And don’t forget: friends and family are very welcome to join us!